This is a repository for deploying a Django + nginx stack using docker compose. I built this to make running a Django + nginx website easier (and for decoupling my sites from only running on AWS EC2 AMIs). It uses docker compose to deploy two containers (django-nginx and django-slack-sphinx) and shares a mounted host volume between the two containers. For now, this runs Django 1.9 in uWSGI mode and publishes errors directly to a configurable Slack channel for debugging. By default the nginx container is running in non-ssl mode, but the container and repo include an ssl.conf file as a reference for extending as needed. There is also a way to run the Django server locally without docker and without uWSGI using the debug-django.sh script. 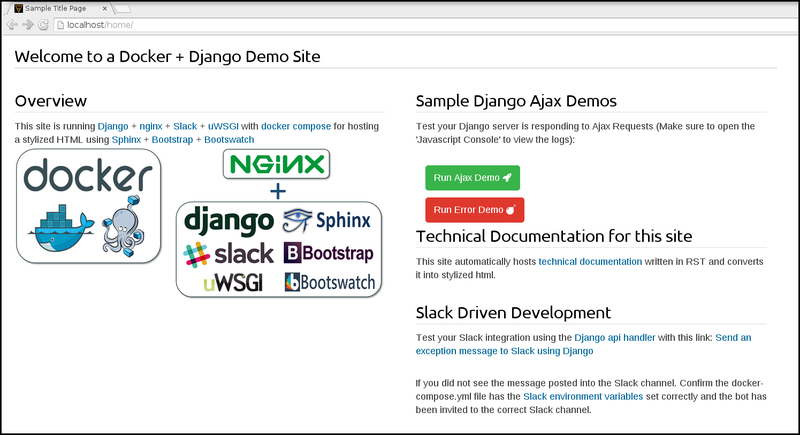 The Django server also comes with two AJAX examples in the dj-ajax-demo.js file. I built this composition for hosting a Django server that is easy to debug using a Slack integration because it publishes exceptions and automatically converts rst documentation into stylized html via the sphinx-bootstrap-theme with bootstrap and includes multiple bootswatch themes. For more details on the Slack workflow, please refer to my previous Slack driven development post. The two containers mount a shared volume hosted at: /opt/web/ and Django deploys the static assets to /opt/web/static for hosting using nginx. Before now, I had to bake EC2 AMIs to run Django and nginx together and this just felt tedious to update and maintain. I want to have the option to not run on AWS and docker is a great tool for helping in this effort. I drink the docker kool-aid...containers make it easier to build, ship and run complex technical components like lego blocks. I also included directories for rebuilding or extending each container as needed in the repository. Lastly, there has been a part of me that wanted to stop battling Django STATIC_ROOT 404 issues once and for all. The Django server is ready-to-go with Google Analytics + Google Search Console. For this initial release, the robots.txt file is just a flat, static file you can change anytime. SEO meta data is helpful when you share a link to your site over social media like Twitter, Facebook, Linkedin, and on Slack because they will automatically retrieve this meta data and embed the values into the post. Please make sure the rst meta data uses the existing tags prefixed with SEO_META_ as it is parsed and injected during the deployment of the container. Each html template file can deploy SEO meta data by storing it in a centralized JSON file that is referenced by the URL. On startup Django parses this JSON file and then whenever the page’s URL is requested the meta data is retrieved and passed using the template context for building the html template. Please refer to the Django Template documentation for more information on how these internals work. Right now the | character is a reserved character in the SEO meta data values. Please do now use it with this release. This composition assumes you have a registered Slack bot that has been invited to the appropriate channel for posting messages. Please refer to the previous Slack driven development post for more details. With the Slack pieces set up, you can change the docker compose Slack env variables and then start the composition. If it is working you should see the bot post a simple debugging message. Please make sure the django-nginx and django-slack-sphinx containers use the same base ENV_DEFAULT_ROOT_VOLUME directory. This composition is using a version 2 docker-compose.yml. It is setup to only expose ports 80 and 443 for nginx. It also specifies a default bridge network for allowing nginx to route http traffic to the Django webserver using uWSGI options and a shared volume /opt/web/static for deploying static assets (js, css, images) for nginx hosting. I built this to host dynamic technical content that automatically converts rst files into stylized html using Sphinx and sphinx-bootstrap-theme discussed in the previous how to host a technical blog post. Just add a new rst file to the rst document directory and restart the Django webserver (or the composition) to see the new posting on the http://localhost/docs/docs.html page. If the composition is setup to run in PROD mode the Django container will run using uWSGI. It uses the django-uwsgi.ini configuration file and specifies the experimental thunder lock performance option. The default configuration file tells uWSGI to run with 2 processes and 4 threads per process. This may not be an ideal configuration for all cases, but it is easy enough to change and rebuild the Django docker container. The --thunder-lock parameter is an experimental feature. To disable it just change the compose file’s ENV_SERVER_MODE value from PROD to STANDARD (anything not DEV or PROD). Here are the steps to run Django locally without docker and without uWSGI. There are two AJAX examples included in the server. Both of which are handled by the dj-ajax-demo.js file and available on the http://localhost/home/ page (just click the green and red buttons).